Lauric acid is a medium-chain saturated fatty acid, also known as a medium-chain triglyceride (MCT). Typically, saturated fats are considered to be bad for your health. However, lauric acid has a variety of health benefits, including antibacterial, antiviral, antifungal and anticancer properties. Lauric acid is the most predominant saturated fat in coconuts and is found in many fruits and seeds. This means that you can easily find lauric acid in coconut oil and other plant-based oils, like palm oil. Lauric acid also occurs in many different milk products. Increase high-density lipoprotein (HDL) levels, which are considered to be good cholesterol. Promote ketosis, which is helpful for people on low-carbohydrate and ketogenic diets. Promote the destruction of cancer cells and prevent cancer growth, particularly in breast cancer and colon cancer cells. Reduce blood pressure and heart rate. Reduce oxidative stress in the heart and kidneys. Combat various types of pathogenic microbes. Lauric acid is able to do this alone or in conjunction with essential oils that can fight foodborne pathogens. It is even given to animals in their feed in order to improve food safety and the quality of the meat. Many of lauric acid's benefits are due to monolaurin. Monolaurin is created by the body when products containing lauric acid are ingested. It's also possible to take monolaurin on its own. Monolaurin's benefits are primarily antimicrobial, in that it fights viruses, bacteria and fungi. Many of monolaurin's potential applications are related to food preservation. While monolaurin's benefits are well-established, lauric acid's benefits are not. As a saturated fatty acid, lauric acid is often associated with the types of fats that are typically thought to be bad for your health. Saturated fats are usually considered to be unhealthy. Their consumption can increase your cholesterol levels and be bad for your cardiovascular health. 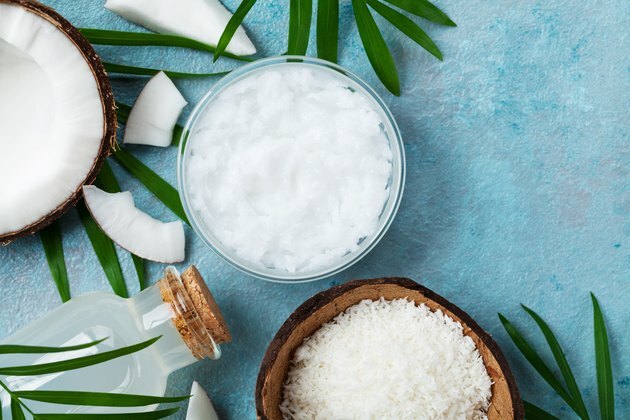 In fact, according to the American Heart Association, products like coconut oil, which is made up of roughly 50 percent lauric acid, aren't even that healthy. However, there are many types of saturated fatty acids, and they aren't all the same. According to a 2015 study in the European Journal of Lipid Science and Technology, these different saturated fatty acids all have varied roles, functions and fates within the body. Some saturated fats are now considered good for you, while others are still considered bad for your health. This level of variation from the scientific community suggests that saturated fats may need to be separated and reclassified sometime in the near future. There are three main types of saturated fatty acids: short-chain, medium-chain and long chain. Short-chain fatty acids have less than six carbon atoms, medium-chain fatty acids have between six and 12 carbon atoms and long-chain fatty acids have more than 12 carbon atoms. Whether a fatty acid is harmful to your health is usually based on the number of carbon atoms it has. Short-chain, saturated fatty acids, which typically come from plants, are generally considered to be healthier than long-chain fatty acids, which usually come from animal products. Medium-chain saturated fatty acids, which include caproic acid, caprylic acid, capric acid and lauric acid, are usually considered to have at least some benefits for your health. Medium-chain saturated fatty acids with fewer carbons are considered to be much healthier than ones with more carbons, like lauric acid. As such, MCTs like lauric acid have disputed benefits. In fact, some research even classes this fatty acid as a long-chain, saturated fat, making not only its benefits, but its status, unclear. Medium-chain saturated fatty acids share some of the same properties of long-chain fatty acids, but are generally considered beneficial for your health. However, the majority of research on MCTs and health focuses on caproic acid, caprylic acid and capric acid. In fact, products like MCT oil, which have well-established health benefits, may lack lauric acid entirely or include it in only very small amounts (1 to 3 percent). Compared to other MCTs and shorter-chain, saturated fatty acids, the pros and cons of lauric acid are unclear. For example, a 2017 study in the Basic and Clinical Pharmacology and Toxicology Journal referred to lauric acid as an anti-inflammatory fatty acid. In contrast, according to a 2015 study in the Advances in Nutrition Journal, lauric acid may have the potential to stimulate the inflammatory response. However, this inflammatory response was present in cellular models, rather than in people, which more recent studies, like a 2017 study in Nature, have also found. However, any immune response was found to be inconsistent when tested in healthy people. Regardless of whether it's actually considered a healthful food, lauric acid isn't like any long-chain fatty acids. While it might raise your cholesterol, it raises the overall HDL to LDL ratio. This means that it doesn't negatively impact blood cholesterol and may even be better for your health than many types of carbohydrates or other long-chain saturated fats. This is supported by the fact that many populations that consume coconut oil do not have high cholesterol or other markers of heart problems. Lauric acid also doesn't promote fat accumulation in the body, unlike longer-chain, saturated fatty acids. This makes it more similar to other medium-chain fatty acids, which are thought to stimulate metabolism and promote ketosis. Lauric acid is also metabolized by your liver; unlike longer-chain saturated fats, its consumption doesn't negatively affect organs such as the pancreas, liver and gastrointestinal system. These longer-chain, fatty acids often require special enzymes in order for your body to digest them, which lauric acid does not.